The great thing about NY is that you will always find something new-- even if 151 other people already know about it. No signs, just a haphazardly opened gate, that leads you down to a dark space. 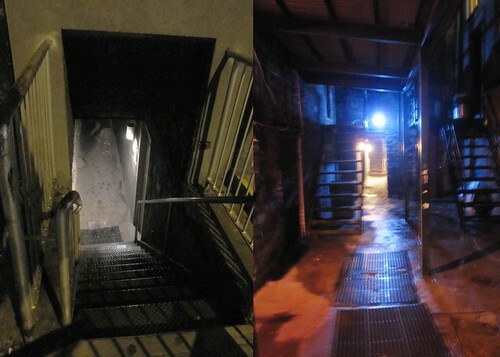 Its not like walking down to a basement restaurant, and BAM the door is at the end of the stairs. You continue walking between two buildings into a courtyard to yet another stairway near the back, upstairs, and then-- you have arrived. Inside is red velvet walls, with heradlic burn outs and full length portraits of women bare breasted in a tasteful way. Couches are large and you cant help but want to sink into them. The crowd, though not that busy on a Thursday 10PM, gets really packed on the weekends. Cocktails are $10, served in tea cups. (I had the Red Light District-- but I think Death and Co and Apothoke mixes it better). If you can get me into the other hidden room near the exit sign, I will buy you a drink.